The Tata Motors group, which is one of the country’s oldest and biggest automobile manufacturer is all set to launch their formidable sports utility vehicle Tata Safari Storme in the car market very soon. This muscular SUV car is eagerly awaited since it was showcased in the 11th Automobile Expo in New Delhi earlier this year. 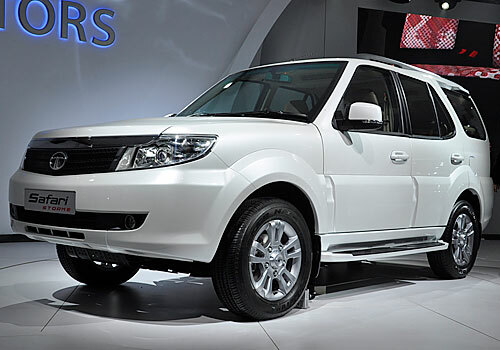 The expected Tata Safari Storme price might be somewhere around Rs. 10.00 lakh, ex-showroom New Delhi, while the final price will be revealed closer to the official launch. The company has complete confidence that this latest entrant will take on all the rivals of its segment and come out as the best in class very soon. The most remarkable feature of the Tata Safari Storme is its tremendous off-road ability that will surely make it the most admired SUV in the market. This SUV has a strong and robust body structure with a huge front façade that houses a bright headlamp cluster with the side indicators and a pair of fog lamps integrated in the front bumper as seen in the Tata Safari Storme pictures. The sides are neat and the stocky wheels add to the masculine look of this SUV. As stated in a Tata Safari Storme review, this hefty SUV will be powered with a commanding 2.2 liter common rail turbo charged, DICOR diesel engine, which will have the capacity to generate a pounding torque of 320 Nm along with a maximum power of 140 Bhp. This engine will be fixed with a 5-speed manual transmission gear box and this Tata Safari Storme will be 4 cylinders car. Apart from the engine and the striking exteriors the company has also refurbished the insides as well for this SUV. The interiors have been designed tastefully to give supreme comfort for all the occupants of this good looking vehicle. In the meanwhile, the coming 12th of April will see the official launch of a new MPV – Maruti Ertiga in the Indian market. I recently discussed about Ertiga vs Innova and Xylo and Tata Motors announces price hike of upto Rs.35,000 post budget.